There are many assets for every company in the form of machinery, buildings, lands, technical assets, etc and the company tries to generate revenue by using these assets and as the time passes, some assets don’t perform because of repairs, some assets which are technical in nature became outdated in the society because of the emerging of new technologies, etc. The company must take all these factors into consideration and expect the accurate lifetime of the asset and determine the value of the asset every year by providing some percent of depreciation. There are various methods for calculation the depreciation and most important of them are Straight Line Method and Diminishing Balance Method. The main aim of this article is to communicate the difference between Straight Line Method and Diminishing Balance Method. The Straight Line Method of depreciation is also called as Fixed Installment Method or Fixed Percentage on Orginal Cost Method. In this Straight Line method, each year on every asset an equal amount of money is provided for depreciation until the asset is reduced to nil or its scrap value at the end of the estimated life of the asset. ⦿ the estimated years of lifetime of the asset(n). Annual Depreciation(D) = 4000-500/7 = 500 dollars. 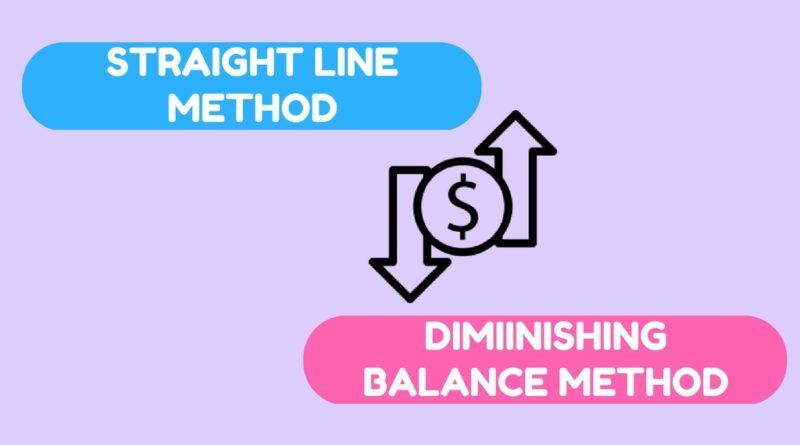 The Diminishing Balance Method is also known as Reducing Installment Method or Written Down Value Method or Declining Balance Method. In this method, The depreciation is calculated at a certain percentage each year on the value of the asset which is brought forward from the previous year. In this method, The depreciation charges in the initial periods or at the beginning period is higher than those in the later period. i.e the depreciation in the initial periods is higher when compared to that of the later periods like after 5 years or 10 years although the depreciation rate is fixed over the years and don’t change.This method is usually adopted for the assets of plant and machinery. By this example, it is evident that the depreciation every year is decreasing and by the end of the lifetime of the asset, the value of the asset is $2916. The depreciation amount provided on the asset using Straight Line Method is constant every year throughout the lifetime of the asset. The depreciation amount provided on the asset is not constant every year but the percent of depreciation is constant. The value of the asset becomes zero or nill at the end of the lifetime of the asset. The value of the asset never become zero at the end of the lifetime of the asset. The depreciation amount of the asset stays same for all the years of lifetime of an asset. The depreciation amount of the asset is higher in the earlier years and become lesser in the later years. Under Straight Line Method, the profits earned on the asset during the earlier years of the asset is higher because of the less maintenance and repair costs. Under Diminishing Balance Method, the profits earned on the asset during the earlier is less when compared to later years. In Straight Line Method, the overall charge on the assets go on increasing year by year because of the increasing maintenance and repair costs of the asset as the time passes. In Diminishing Balance Method, the overall charge remains more or less same because of the decreasing depreciation in the later years and increasing repair costs as years pass. Both Straight Line Method and Diminishing Balance Method have their own merits and demerits in providing the depreciation for the assets. The straight line method is very simple to understand and easy to calculate whereas the diminishing balance method is helpful in better matching of revenue and expenses derived from the asset by the company.